“Marie designs and delivers world-class interactive keynote presentations and workshops. The depth of her understanding of organizations and people combined with her ability to find constructive and creative solutions is amazing." Engaging, bold and light-hearted. Before empathy in the workplace was popular, Marie named it as a critical skill for the 21st century workplace. 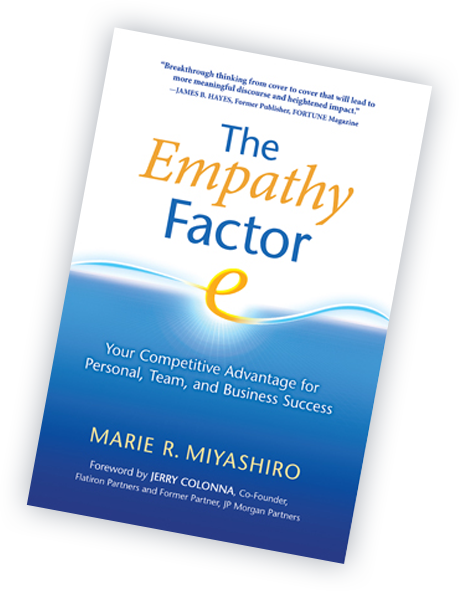 Since the publication of The Empathy Factor, Marie delivers uncommonly authentic and practical keynote talks around the world as an internationally recognized thought leader in the field of human connection at work. Employees want meaningful work and to be seen as more than the company roles they play. Customers now demand authentic communication and personalized service. Marie develops and delivers custom programs with field-tested empathy processes and tools for repeatable, scalable and transferable success. The results are happier, more motivated employees and loyal customers. Human connection based on empathy is the foundation of high-performing leaders. Marie coaches leaders and teams to blend empathy with progress and growth. This seeds and feeds a culture of practical empathy that leads to decreased stress for leaders and an increase in motivated employees, loyal customers, and increased productivity and profit. Many mistake empathy for softness or permissiveness. However, it’s vital to realize that deep empathic connection and true compassion are not about being nice. Instead, they’re about engendering both personal and group responsibility to effect change and put organizational strategies into actions that get results. Thankfully, putting oneself in someone else’s shoes can be learned. While basic empathy is natural to human beings, actionable empathy is cultivated.